Las Vegas has seen amazing economic growth in this decade. It has invited huge development projects and investments. Many of the economic factors contributing to the index have seen positive increases while others are flat or slightly lower. "Still, the six-month forecast remains flat, (with) no clear sign of an overall recession in the data, despite the veil of pessimism coming from the media," economist Keith Schwer said. It's amazing the economy has remained as resilient as it is in light of the recent softening of the real estate market in the valley. If the Las Vegas continues strong and the large projects are completed, there will be considerable growth in many industries as real estate recouperates. Many experts and analysts who know the valley suggest commercial projects will taper off some. Las Vegas commercial real estate has been hot because previous residential growth outran the important commercial infrastructure. Las Vegas real estate agents are anxious to see what happens over the next year or so. Some believe another small boom will occur due to housing needed to support the jobs to be filled by some of these large-scale development projects. Some estimate jobs requiring 60,000-100,000 residents will need to be filled. 60,000 is more people than there are existing residences including rentals and listed homes. Some expect even more positions through 2009 which will shorten supply further and increase demand. 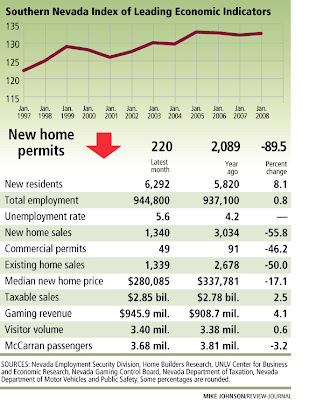 The next year should be flat in southern Nevada economy and housing. However, subsequent years could see considerable growth.